Thank you for interest in the Bavarian Grill. 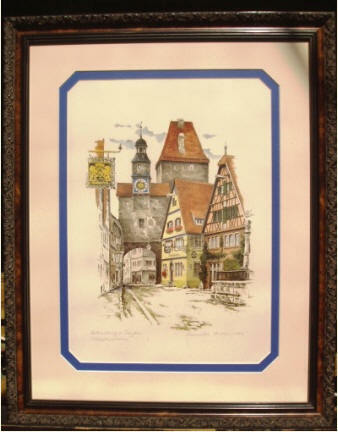 We own some lithographs of picturesque places in Rothenburg ob der Tauber in Bavaria painted by Monika Heller-Cole. From time to time we receive requests from our friends who like to find out more about the artist, but we do not have any further info available. So, if you can help us with any piece of knowledge we would love to share this information with others on this web page. 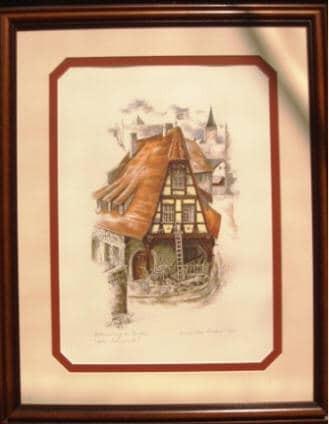 I came across your web page in which you asked if anyone had information on paintings you have in your restaurant by Monica Keller Cole. I think the artist’s name is actually Monika Heller Cole. 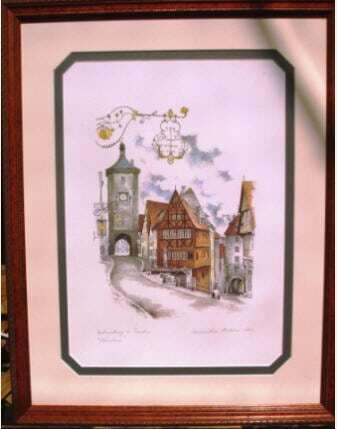 I have some of her paintings from when I was stationed in Germany in the 1980’s. We bought two of her paintings, winter scenes, from her husband who was selling them at a Christmas bazaar in Mainz. (He’s American). After we got them home, we decided we did not like the matting on one and called him to see if he would change out the mat. He said Sure, but you have to come to my house (as the bazaar was over). We went to Allersberg and were invited into their house. Monika served us coffee and snacks while he changed out the mat. It was a wonderful afternoon with two wonderful and talented artists. If you search on etsy.com or Google images, you can find more of her work. All pictures are undated. They were purchased and framed in Plano, Texas in 1995.